Donald Trump has been a complete shock to Wall Street. He's not "their guy," many of his policies make CEOs cringe, and Goldman Sachs CEO Lloyd Blankfein has even gone on record to say: Trump's "finger on the button blows my mind." If Trump wins the White House, numerous business and economic leaders predict the stock market and economy will tank. The usual Wall Street reaction to a shock like Trump is to sell, sell, sell. Investors hate uncertainty, and Trump is unpredictability on steroids. Yet so far, Trump isn't scaring investors. 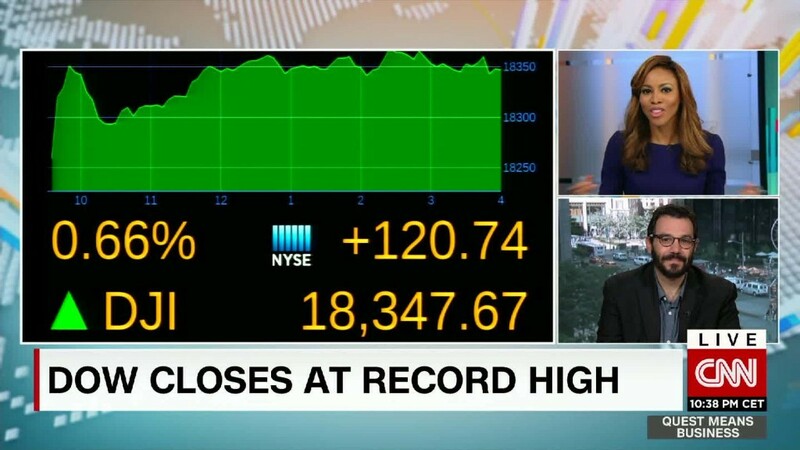 U.S. stocks are at all-time highs. This week both the Dow (an index of 30 large American businesses) and the S&P 500 (an index of 500 top U.S. companies) hit record levels. It's simple: Wall Street thinks it's highly unlikely that Trump will be the next president of the United States. Clinton has a solid lead in all major forecasts. In CNN's latest poll of polls, Clinton gets 45% of the vote versus Trump's 40%. Even if Trump does win, Wall Street predicts he won't get much done. Morgan Stanley (MS) has dubbed this the "age of incrementalism" in U.S. politics. Presidential candidates promise sweeping changes, but they rarely deliver because in the American political system the president can't do much without the support of Congress. "Attempts by Clinton or Trump to exercise transformative power domestically will be stunted," wrote Morgan Stanley in a 50-page special election report out this week. "Current evidence suggests the U.S. elections in November won't yield outcomes that substantially change market fundamentals." Like many forecasters, Morgan Stanley predicts Hillary Clinton becomes president and the GOP keeps control of the House. It's more divided government, regardless of which party wins the Senate. Republican House Speaker Paul Ryan has made it pretty clear he's got his own ideas on taxes, trade and other matters that don't match up much with either Clinton's or Trump's. But what if Trump does win...? The base case scenario doesn't freak out Wall Street. But some wonder whether the U.S. election could turn out to be like the shocking Brexit vote. Will the polls get it wrong in the U.S. election too and leave investors scrambling for safety at the last minute? "This extraordinary political volatility hasn't sunk in yet on Wall Street," said Greg Valliere, chief strategist at Horizon Investments, back in April. That's even more the case now -- just over 115 days from the election. "It's a toxic brew for the markets." Sure, a "modest Clinton win" is likely, Valliere says, but he sees the other two scenarios (a strong Clinton win with the Senate flipping Democratic or a Republican sweep with Trump in the White House and the GOP controlling both chambers of Congress) as very scary for the market. He predicts Clinton would be emboldened by a big win and likely use her presidential powers to heighten scrutiny of Wall Street and other businesses. In contrast, if Trump won, he would probably move quickly to get the U.S. out of NAFTA and potentially enact tariffs on key trading partners. For now, it's all eyes on the polls from the "rust belt" states. If Trump starts pulling ahead in places like Ohio and Pennsylvania, Wall Street will likely start making moves to sell stocks and buy bonds, gold and Bitcoin.